Alleged victim Ahmed Darwish appears to await instruction before turning to address the camera. According to Pannell’s narration in Saving Syria’s Children: “Thirteen year old Ahmed Darwish was described as a hard-working student with a smiley face. He did survive. We found him a few weeks after the attack in hospital in Turkey, with 40% burns to his body”. 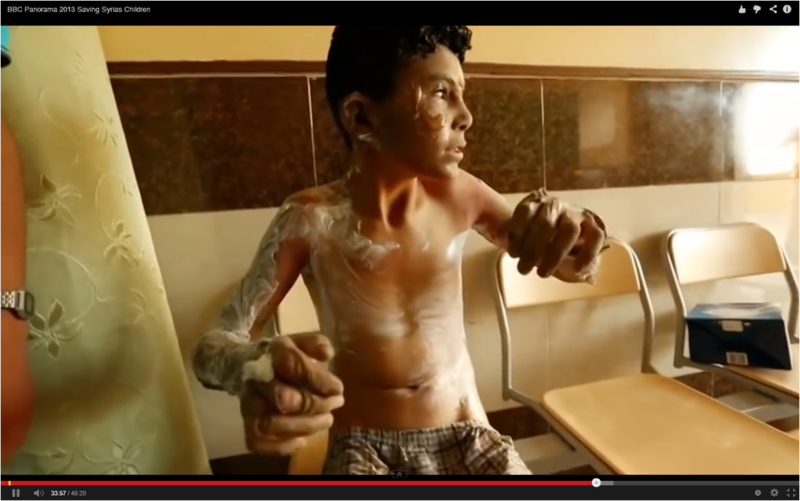 Dr Saleyha Ahsan, one of the British doctors featured in Saving Syria’s Children, says of Darwish’s hands “the skin was falling off as if he had been peeled”. 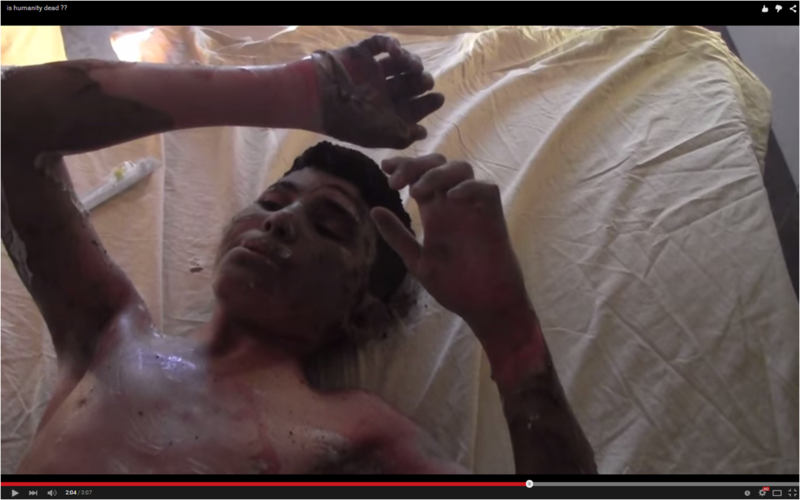 However a practicing medical doctor consulted privately has stated of the victims in Saving Syria’s Children “Some are shown with skin hanging off but the flesh beneath is not that convincing it actually looks like more skin.” (See also images of Lutfi Arsi). In my initial letter to the BBC I noted that, while in the images from “a few weeks after the attack in hospital in Turkey” (Figs 3 & 4) Darwish has black scabs on his lips, no burns to his lips are in evidence in the scenes from the day of the alleged attack (Figs 1 & 2). In my second letter (section 8) I further noted that medics at the scene had presumably shared my view that Darwish had no burns to his mouth as this area appears to be free of the white cream that had been applied to much of the rest of the boy’s body. In response, BBC Audience Services (in a letter authored by Ian Pannell) provided Fig 5 below, stating “Ahmed does have burns above his lip. Here is another screen-grab where you can just about detect that”. Note, however, that while the object which Pannell identifies is above Darwish’s top lip, the prominent black scab in Figs 3 & 4 is on it. Here (24 seconds, Figs 8 & 9) he is seated in the hospital corridor as in Figs 1 & 2. In Figs 6 & 7 the object noted by Ian Pannell above Darwish’s upper lip (Fig 5) may just be discernible. 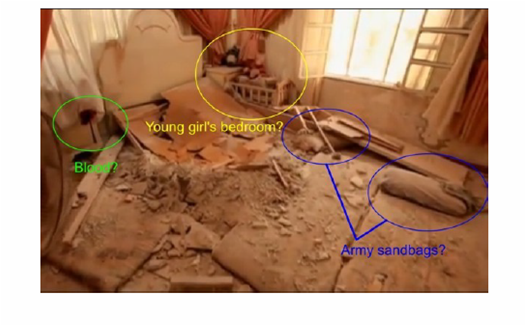 In Figs 8 – 11 (with 10 & 11 presumably representing the latest images of Darwish on 26 August 2013) the boy’s lips appear unscathed. My view is that the object which Pannell identifies above Darwish’s top lip in Fig 5 is a portion of the translucent substance that is visible on much of the rest of the boy’s face in that image (as well as in Figs 1 & 2) and which is possibly a different substance to the more visible white cream applied to the rest of his body. 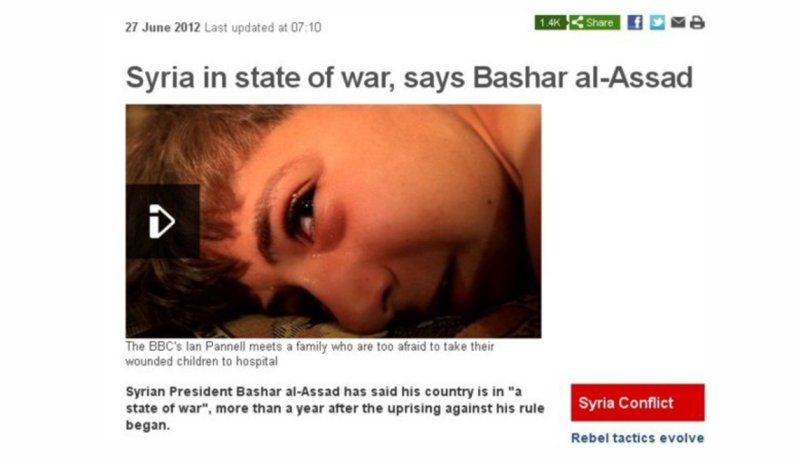 In the BBC 10 O’Clock News report of 29 August 2013 Pannell states that Darwish is 15 years old. “Cold-water therapy was being applied to all the patients but there were no adequate facilities to stop them becoming too cold with the application of cold water and they were shivering. Bags of saline solution were being ripped open and poured onto the casualties as they sat on the floor of the hospital reception room”. Presumably, therefore, Darwish’s shivering is a result of the “cold-water therapy” administered after his arrival at the hospital, as opposed to his condition “When he arrived”. Strikingly, at 2:46 in the report Darwish appears to nod in communication to someone off-screen before turning to speak to the camera. (See sequence below). In the BBC Senior Editorial Complaints Adviser’s decision of 26 September 2014 Ian Pannell identifies the hospital as “Diskapi Yildirim Beyazit Training and Research Hospital in Antakya – home to one of the country’s specialist burns units”. This video is notable for the appearance (at 1:05 in this version) of the Dutch-Armenian woman who contacted me on Facebook in June 2014, stating that she did “not want others to see” images of her at Atareb Hospital. 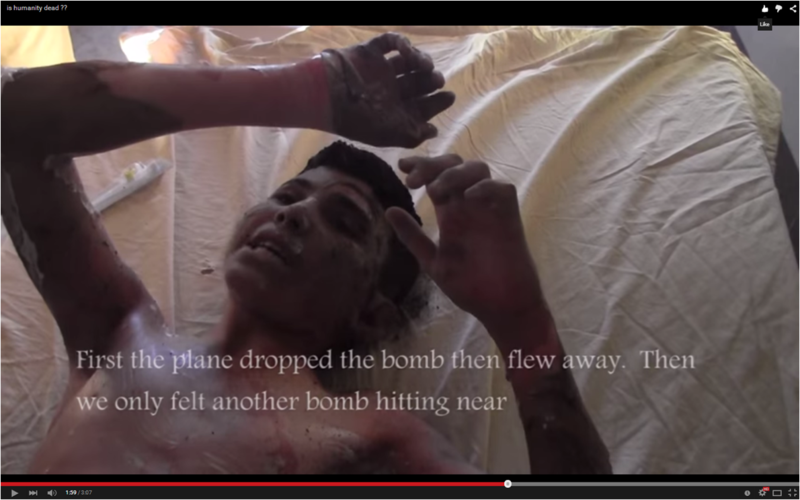 Darwish’s account of the alleged attack (“First the plane dropped the bomb then flew away. Then we only felt another bomb hitting near”) echoes those offered by the alleged teacher and the younger “black dress woman” in their respective, highly unpersuasive, You Tube video performances here and here (partial translation of latter here). 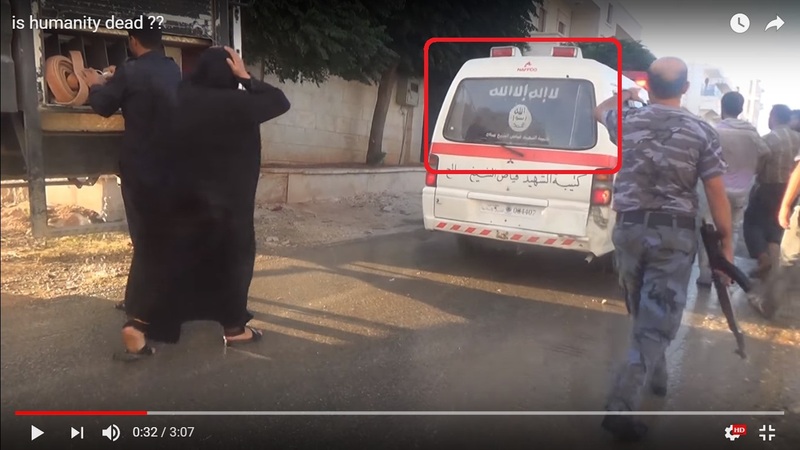 Also visible in the ambulance are Ridwan Qambari and another presumed relative (in the green shirt) of Siham Kanbari. Do you think this could also be the same actor? No, it’s a different child. All the VICE footage appears genuine.